For those of you who have children you know that when you are expecting your first child things are of course unique from when you find out you are expecting number two, three, four, etc. I know that kind of goes without saying but now having two children of my own, I understand what Kevin (my husband) was always telling me in the beginning with my first with Dane. He would always tell me "you won't need that" or "that will never come out of the package". We tend to go over board as first timers and of course its because we are learning. We are bringing a new life into the world and that is something scary and exciting all in one. So I was obviously one of those first time moms who went out got one of everything (two if applicable). I wasn't about to miss one single detail. As most newbies, one of the things I bought with Dane was a baby carrier. 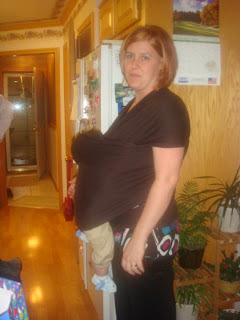 At the time I had no idea on how important carrying or "wearing" your baby was. I was more interested in the fact that it might help me with my chubs of a baby. My back hurt all the time and of course I wanted a few hand free moments. My parents bought me the jeep brand - big mistake. This wasn't because of its quality as we all know jeep is a brand we can trust (or at least I feel that way). It just didn't work well. I don't know if it was my biggin of a son or just the fact that it was a kid in a backpack. I was very uncomfortable and felt as though it never supported him correctly. Then, one day in a play group when I was pregnant with Declan, I noticed one of the other mommies using a Moby Wrap. It looked so confusing with all this fabric that never seemed to end. As curious as I was it just seemed to complicated. After several days of watching her though I had to learn what this as all about as her baby looked so comfy and peaceful. She and a few others in the group quickly showed me how to wrap myself up and all the ways it could be worn. I was still confused. But again it worked great for all of them so I had to have one to give it a try. A month or so before Declan was born, I bought my first Moby Wrap and practiced several times with a doll at tying it quickly and properly. Still I wasn't too convinced but then, I brought Declan home. Again there are so many items I've purchased and used once and others I've used a ton. But, there has never been an item I have used and appreciated as much as my Moby. I am so mad I didn't have one when I had Dane because I loved it so much this go around. The most important part of the wrap is the bonding time you get with your baby even when your not trying to. I always told others it was like still being pregnant because of how close you are to your child at all times. You are literally wearing your child. I always found myself rubbing my belly (or really the baby) as if I still were pregnant. Once baby is placed in the Moby, it requires no hands. You can easily move around and complete lots of everyday tasks and chores or just plain give your arms a break. If you are not as big breasted as I am, you can safely and discretely breast feed your child even while doing these tasks. I only did so a few times because I was afraid I would smother Declan. Everywhere I went, I wore Declan. I barely used my stroller except as a shopping cart. People constantly asked me about it or complemented me on it and I preached about its perks to everyone. My friends and family thought it was wonderful themselves and my parents even learned how to use it for when they were babysitting or giving me a break. Definitely, my first pick for best item I have ever purchased and will never have another child without using one. Recommendation: Get one! If you don't buy anything else this is the best item I can recommend for a newborn! They are not even expensive for a baby carrier either. If you head over to a store like Babies 'R' Us then you can use a coupon to get one for even cheaper!